Here is the giveaway I promised. It is an over-the-arm pincushion I made. It fits nicely over the arm of your chair or sofa with a couple of pockets for a small pair of scissors and thread. 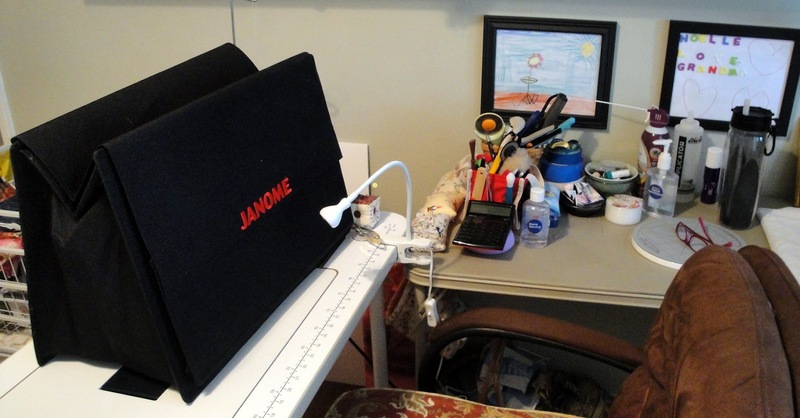 Since I have company in town for a while, I won't be drawing the winner until Sunday, August 4, 2013. To enter just leave a comment on what you are currently working on, or how you are spending your summer (or winter). And, please make sure I have a way of contacting you. I thought I was going to finish my house quilt this week; but, then I realized that my sewing room is going to stay looking like this. And, probably for a couple of weeks. 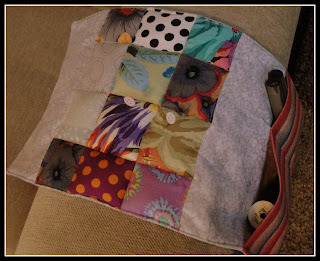 I will be having company and running about town, planning a couple of house projects and that means the sewing machine is taking a break. Maybe I can fit in a Give Away. Stay tuned. Oh, and today is my birthday. And, I have a great day planned! 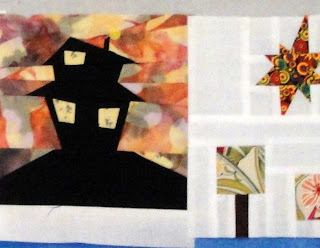 My House Quilt isn't finished. 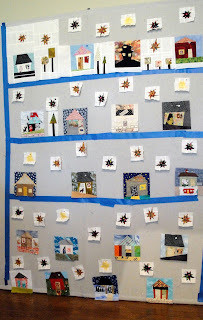 I will continue to work on it next week. 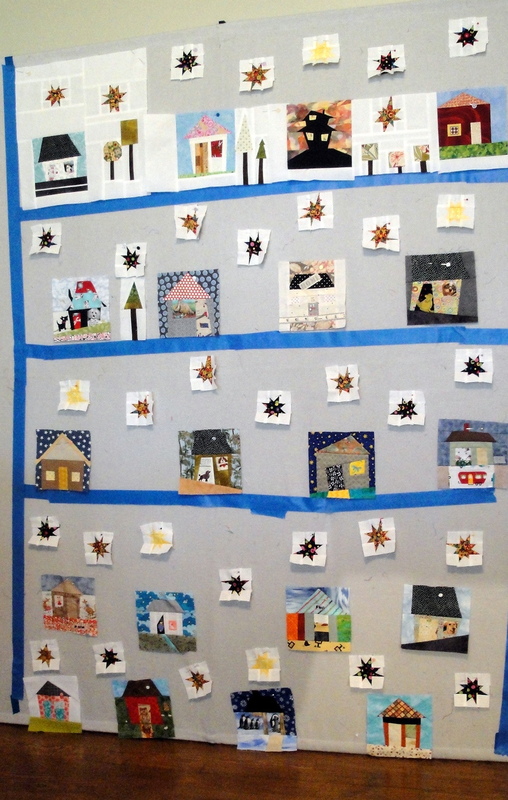 It has been a bit more of a challenge than originally anticipated. But, you know, that is a good thing. It is nice to be challenged. Here is how my week went. and close up of what's finished, so far. I have a wonky border in mind. So far, it is only in my mind. 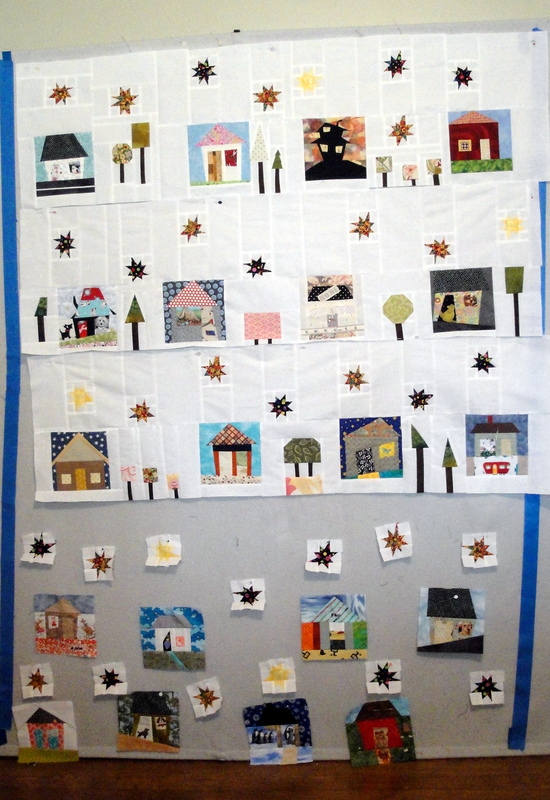 However, I did finish the Nine Patch for the Tea and Auction in October. 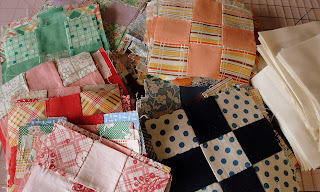 Hoping to get these house blocks (from a swap) made into a quilt top this week. I have started to play and it is taking a lot longer than I thought it would. Hoping, hoping, hoping. . . . 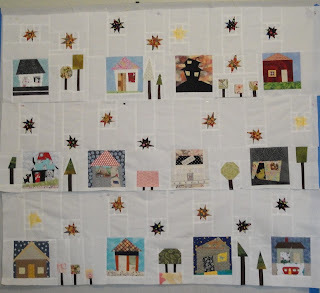 I quilted on the nine-patch quilt all week. I expected to either get bored or finish sooner so I could work on some of my small kits. But, no. 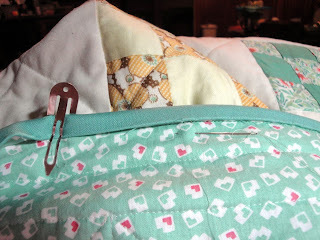 I did, however, get the top quilted. 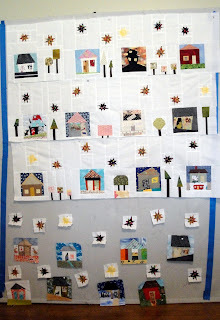 I stitched in the ditch around each 5" block and then diagonal on each block. Simple, yet it feels right. 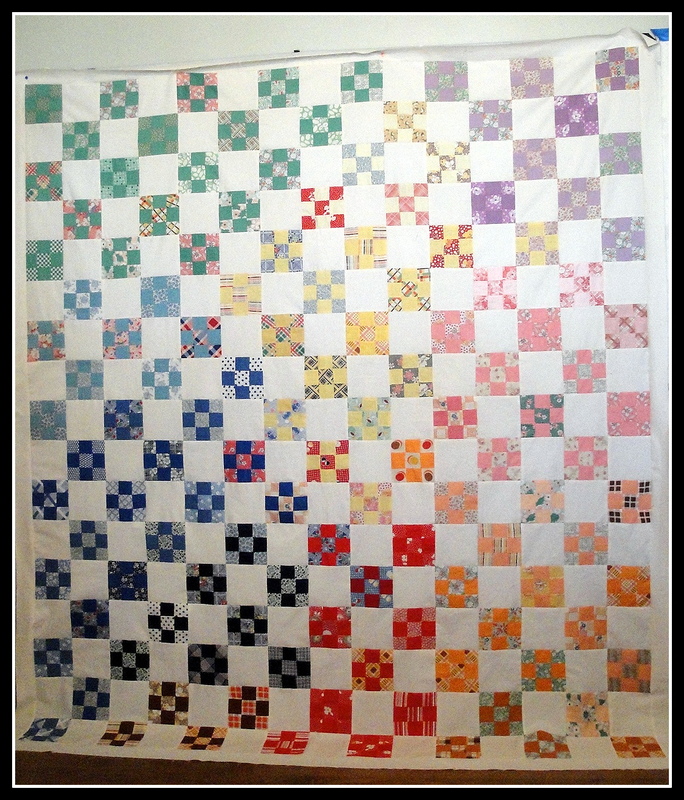 This week will be spent quilting this, which I finished last week. The backing and binding fabric I found at my favorite go-to fabric store, where everything is 20% until the 15th. Bonus! 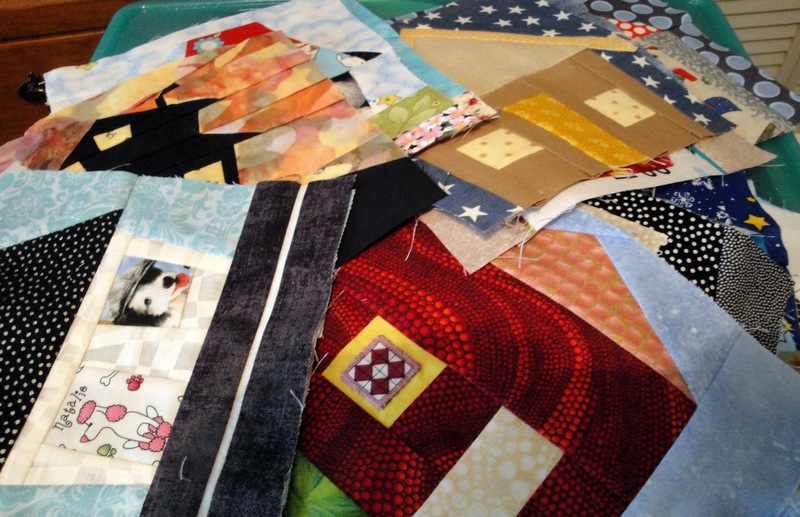 In addition, I have a few small kits cut out to work on when and if I get bored with just quilting. 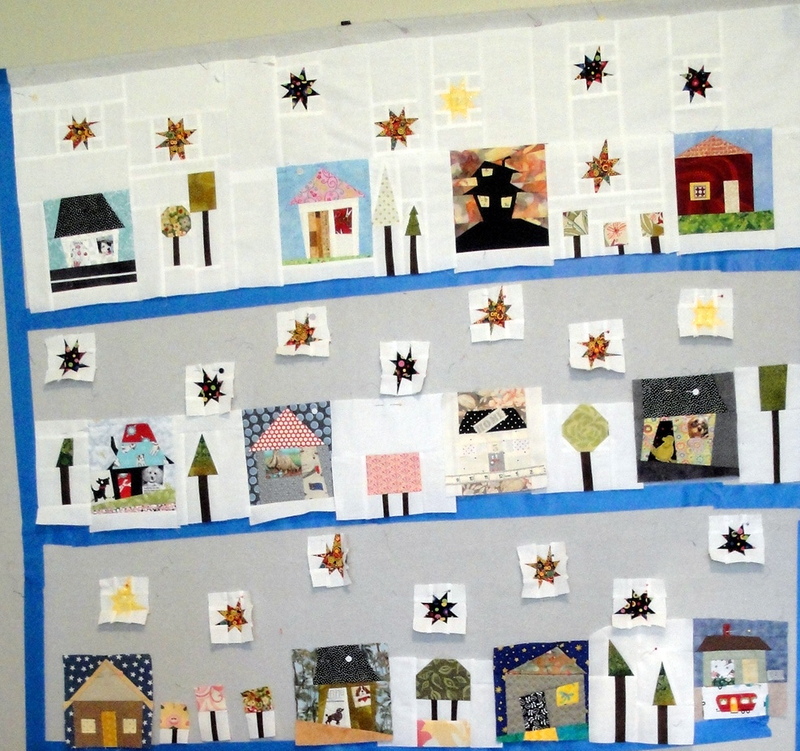 I must say this was a fun project putting together these blocks. I decided to make it about color really. So, I grouped like colors together as best I could. 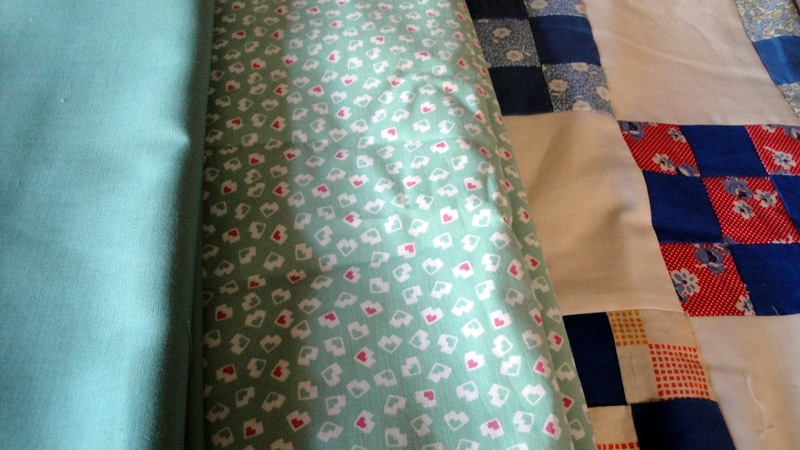 I agonized over whether to make it a square quilt or use all the blocks to add a little more length. 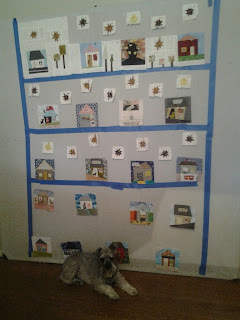 Then I agonized over whether to add or not add a border. 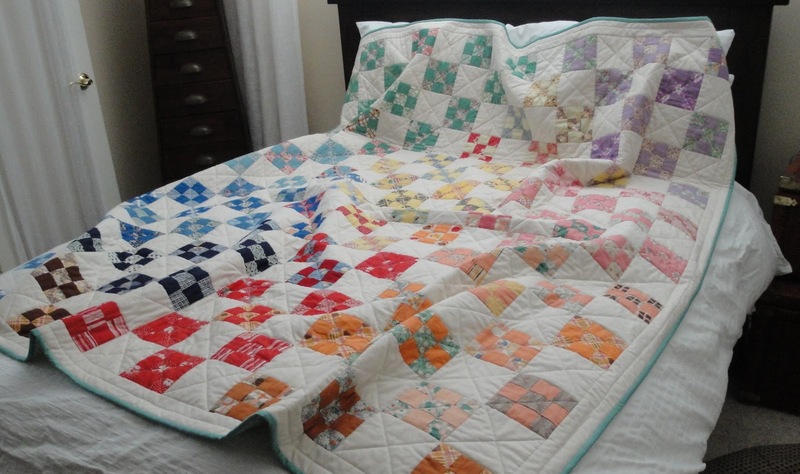 I looked around the internet and it seemed like there were very few vintage quilts that utilized borders. So, I asked my friend, Susan over at The History Quilter, who echoed that rarely were borders utilized in this era vintage quilt, and if they were it would be a skinny border. So, I have used a 2.5" border and will add a solid color binding. 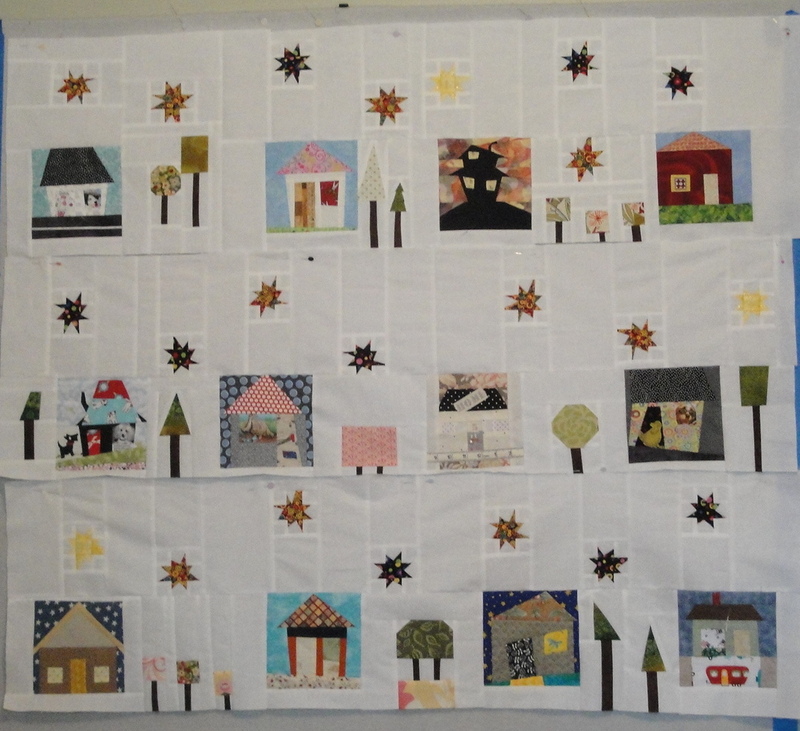 It now measures 76" x 81" and all but 2 blocks were used. 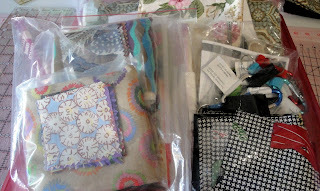 Lucky for me (and most quilters living in the area) that M & L and Jenny's is having their annual sale starting today. Wahoo!! Guess where I'm off to hunt for a special backing? 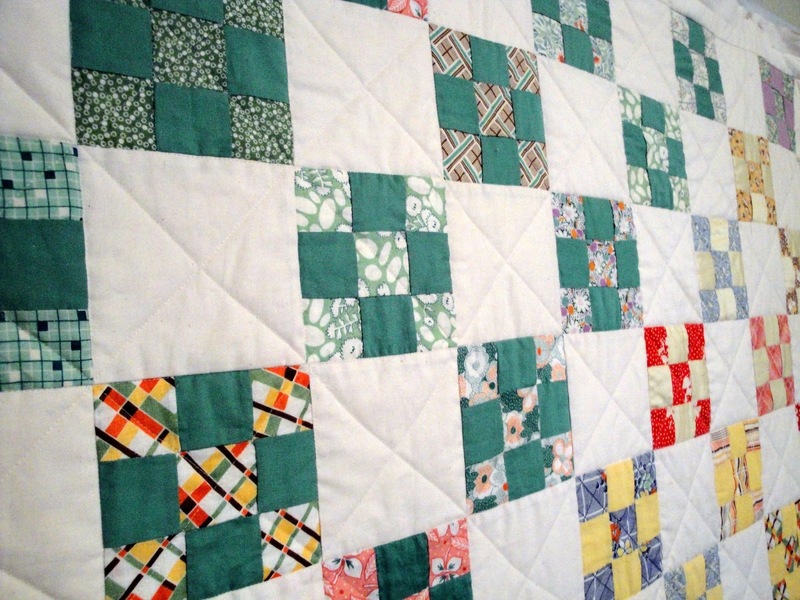 The Orange Grove Quilters Guild was given these hand-pieced, vintage fabric blocks. 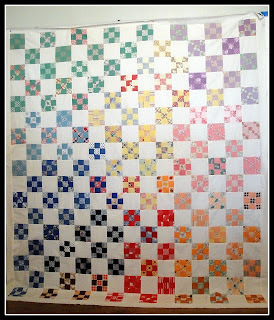 I offered to turn the 124 nine-patch blocks into a quilt for the upcoming Tea and Auction in October. 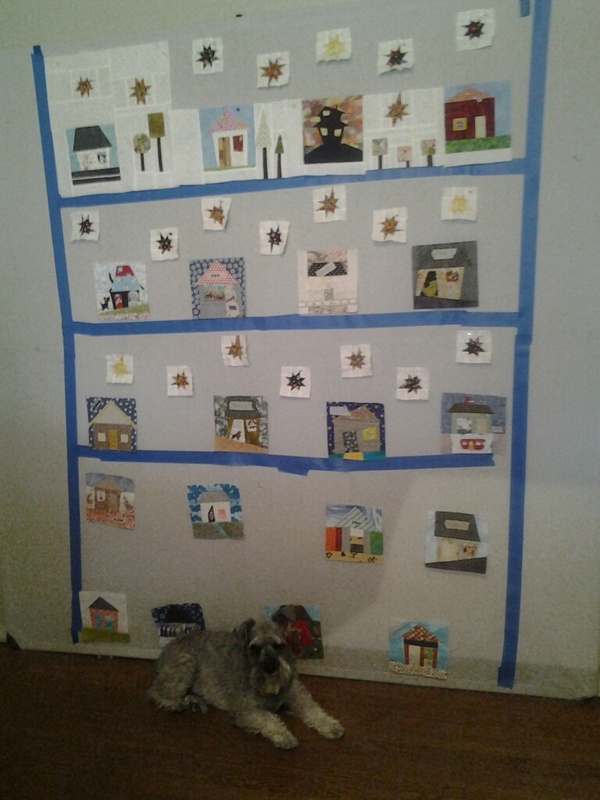 My goal for this week is to finish the quilt top. Still deciding if I will send it to a quilter or quilt it myself. I'll know when the top is completed. They are five-inch blocks and I am adding Kona Cotton, Natural. 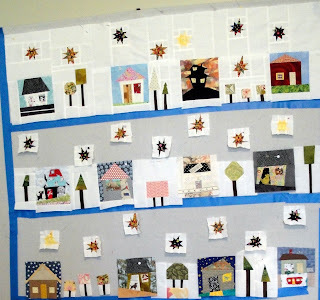 No, it will not be hand pieced or hand quilted. We want it for this year's auction.